I started reading this book by accident. I first stumbled across this series during Top Ten Tuesday when I saw How the White Trash Zombie Got Her Groove Back on another blog and was immediately intrigued. I'm not the biggest fan of zombies; zombie films tend to creep me out more than anything (even Shaun of the Dead!) and for whatever reason I just don't find myself picking up a lot of zombie fiction because it all seems very samey to me. Apart from Mira Grant's Newsflesh trilogy, of course, which I adore with all my being. 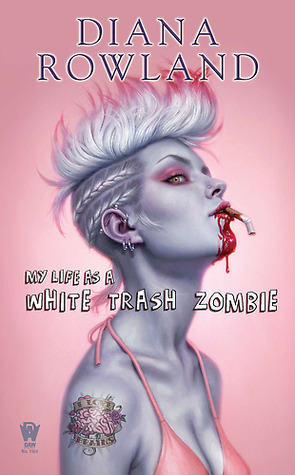 My Life as a White Trash Zombie stood out to me because it's more along the lines of Warm Bodies than The Walking Dead. Yes, zombies are technically dead and yes, they eat brains to stay alive, but when they're alive they're alive. They're real people with feelings, and I loved this different way of looking at zombies that didn't involve groaning, grunting corpses. Angel is the kind of heroine I never knew I needed in my life. I'm always ready for new heroines that aren't presented in the usual way heroines are in urban fantasy; if I'd known Angel in school I probably wouldn't have liked her very much at all, but Rowland writes an engaging, endearing and funny protagonist whom I knew I was going to love as soon as I started reading. She's honest and unfortunate and ultimately good, and I think she may be a new addition to my list of favourite heroines. Basically this book was just what I needed to read, because I was headed for a reading slump until I cracked it open, and I've already ordered the next three books in the series so far - I can't wait to see what Angel gets up to next, and I'm so pleased that this book I picked up on a whim has introduced me to a new series! I have yet to really get into the zombie genre, but I keep seeing this one pop up.